Over three decades of neoliberal policies had a severe effect on labour, in developed and developing regions alike. In developed regions, neoliberalism managed to crash the resistance of organised labour, significantly curtailing its institutionalised power and splintering the ‘industrial citizenship’ that characterised the Keynesian era. As increasing shares of manufacturing production migrated towards developing regions, where the new development paradigm increasingly turned towards export-oriented strategies, armies of sweated labour were recruited to be deployed in the context of transnationalised production regimes. The logics of export-oriented industrialisation have been ferocious with labour in the so-called Global South. Simply reconceptualised as ‘comparative advantage’, here labour has been exposed to harsh patterns of commodification. As illustrated in many empirical studies focusing on global production networks, the exploitation of various informal institutions and deeply-rooted structural differences, such as gender, caste, ethnicity, mobility or geographical provenience has fuelled a ‘race to the bottom’ functional to the reproduction of labour as a flexible, disposable and ‘cheap’ commodity. Martinez-Novo (2004) stresses the relevance of gender and ethnicity in segmenting labour engaging in export agricultural production in Mexico. Ngai (2005) highlights the relevance of gender and mobility in shaping the identity of Chinese working classes engaging in export manufacturing, and my own work on the Indian export-oriented garment industry has mapped the distinct use of multiple ‘traditional’ structures of power to reproduce and tighten control over the Indian workforce (see Mezzadri, 2008). This process of informalisation of labour has generated a vast footloose proletariat, who lives in a ‘Global Factory’ (Chang, 2009), but whose modes of existence are increasingly complex and varied (Bernstein, 2007). By 2006, according to Mike Davies (quoted in Bernstein, 2007: 5), this proletariat was ‘one billion strong and growing, making it the fastest growing and most unprecedented social class on earth’. After bearing the brunt of the neoliberal capitalist logic for so long, it is somehow paradoxical that labour must now also bear the brunt of the current crisis of this logic. However, that is clearly the case. On the one hand, a point that is widely discussed, in many countries in Europe and in the US the costs of the crisis of the financial elites have been socialised by the state, while working classes were loosing their homes in a context of growing unemployment and insecurity. On the other hand, a point that is less widely discussed, the southern footloose proletariat might pay an even higher price because of the crisis of the system that subjugated it so harshly. The crisis, in fact, is slowly revealing all the contradictions and the limitations of overtly ‘outward-looking’ development strategies. In some ways, one could argue that the working poor in many developing regions are going through a crisis which is effectively centuries old. It is a perennial crisis of reproduction, strenuously fought through highly diversified livelihood and survival strategies. However, imposing export-orientation as the deus ex machina for successful development, and boosting the process of informalisation of labour, neoliberalism has effectively created new vulnerabilities and patterns of dependency for the working poor. The present crisis of this system is now exposing these vulnerabilities in compelling ways. This is the case even in China and India; the two countries which, according to many observers, have benefited the most from export orientation, exploiting their huge reservoirs of cheap labour. In China, it is reported that floods of migrants (in the range of tens of million) have started their exodus to return to the rural hinterland, abandoning the buzzing urban industrial areas of the workshop of the world. The hukou (household registration) system, establishing a two-tiers citizenship system, welcomes Chinese rural migrant proletariat in the city only when it is employed. By the same token, the Indian labour employed in export-industries in many urban industrial areas seems to be making its way back to the poor states of the Hindi belt, such as Bihar and Uttar Pradesh, where its largest share comes from. The exodus of the ‘disposable workers’ has started, and it is hard to predict its impact in different developing regions, and - within each region - its implications for either the urban or the rural economy. Focusing specifically on India, the exodus of migrant workers employed by export companies looks already accompanied by other trends, negatively affecting labour. Workers facing retrenchment but deciding to stay in the city, for instance, will increase the vast pool of slum-dwellers that Indian metropolis adjust, need, hide and exploit in the urban informal or shadow economy. Decreasing opportunities in the export-based factory realm of production might lead to increasing shares of subcontracting to informal units, further fragmenting domestic supply chains which are already very complex and layered. Rough estimates indicate that by the time the crisis hit, if direct employment in export units could be set at around 6.5 million workers, there were already some 15 million workers indirectly incorporated into export production (Kumar et al, 2009). According to Jayati Ghosh, the crisis would lead to an increase in the use of home-based workers in various light manufacturing activities, ranging from textile, garments, electronics, gems and jewellery. This is likely to have a very uneven gender impact, as generally Indian home-based labour tends to be primarily female. Prior to the crisis, estimates indicated that over half of the 15 million female informal workers in India were involved in home-based work for different types of industry (see Ghosh’s contribution in Kumar et al, 2009). Now, this estimate may skyrocket even further, signalling a deepening of gender segregation in labour markets. Therefore, in India, not only is the crisis likely to further boost the pace of the process of informalisation, but it also seems to be significantly reshaping and recrafting its patterns. At the moment, evidence suggests a movement away from the factory realm of production, and towards, instead, an increasing use of petty commodity production and household labour. Petty commodity production is often used as a cushion against different types of economic shocks. Organised in small clusters in many parts of the subcontinent, the particular resilience of this type of production can be partially attributed to its ability to shape what have been defined by some as social and economic ‘networks of survival’. In the context of the present crisis, a partial substitution of casual and precarious factory labour with informal petty production would effectively entail a substitution of wage-labour with disguised forms of wage-labour, determining a further fragmentation of Indian working classes, a further splintering of the informal proletariat according to multiple lines of socio-economic differentiation, and a further move away from potential attempts to organise this proletariat in meaningful ways. 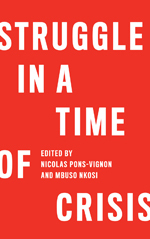 As, once more, the crisis of capital turns into a crisis of labour, and the ‘race to the bottom’ continues, here the bottom seems to be worryingly moving further and further down, crafting new aggressive interplays between informality and poverty. Alessandra Mezzadri is lecturer in Development Studies at SOAS, London, where she teaches in the MSc Development Studies and in the MSc Globalisation and Development. Her research work focuses on neoliberalism, global industrial restructuring, and their impact on labour in developing regions. Her area of expertise is India.